I quite liked Offworld Trading Company, and part of that was down to how good the game looked. For what could have been a very dry game (it’s basically a stock market simulator), it looks great, almost cute, with a wonderful, toy-like quality to the units and landscape. 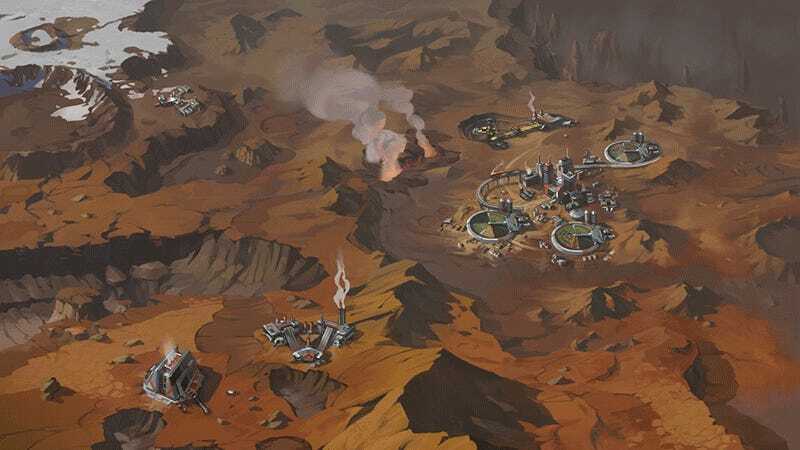 I have never played a game like Offworld Trading Company. So it’s a pleasure to be able to highlight a bunch of the game’s art (and artists) with this Fine Art feature. While most people know OTC was designed by Civ IV’s Soren Johnson, its art team also has experience with Sid Meier’s series: art director Dorian Newcomb held the same role on Civ V, environment artist Erik Ehoff did Civ V’s wonder concepts and paintings and Jason Pastrana—who did OTC’s posters—designed all the buttons for Civ V.
The final member of OTC’s art team, Bryce Homick, also used to work at Firaxis; designing a lot of this game’s buildings, he had previously done similar stuff on XCOM, where he worked on the game’s base. Below you’ll find a wide range of art done for OTC’s development, ranging from environmental pieces to character art to unit design.